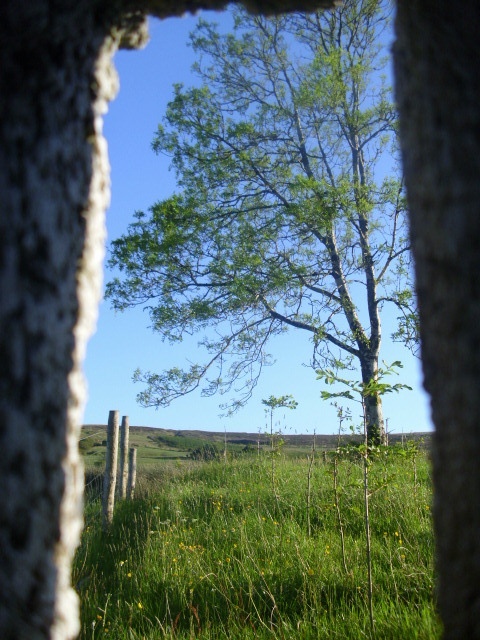 Ash tree in back field. 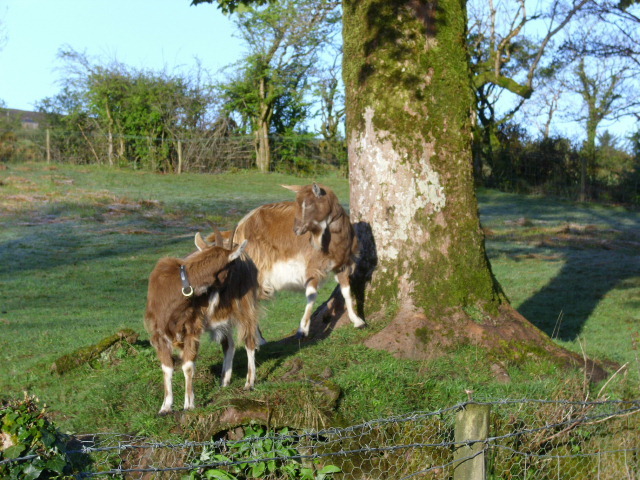 There are differing opinions about the number of native Irish trees. A general consensus seems to be 18. 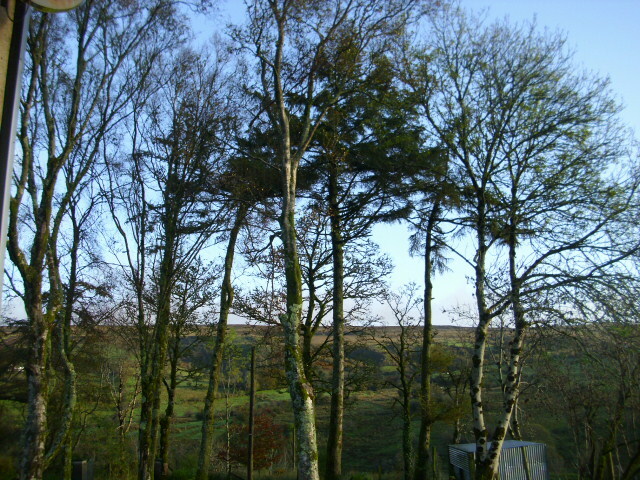 Ash is one of the commonest trees. It grows on all soils and self seeds readily. 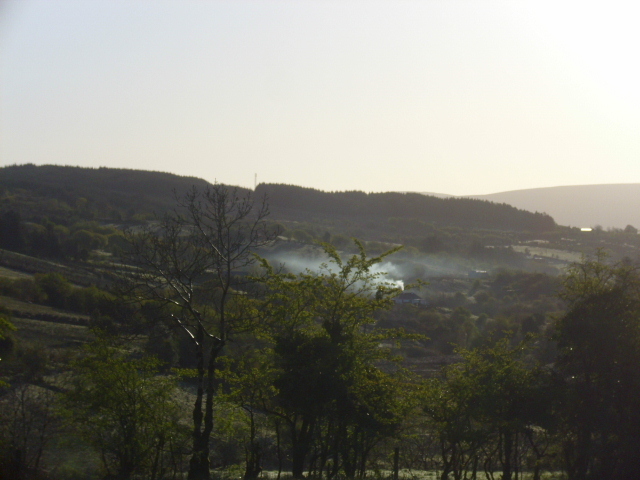 The national game of hurling is played with hurleys made from Ash. It is also a great tree for burning and can be burned from green. Scots Pine at Lough Rynn. 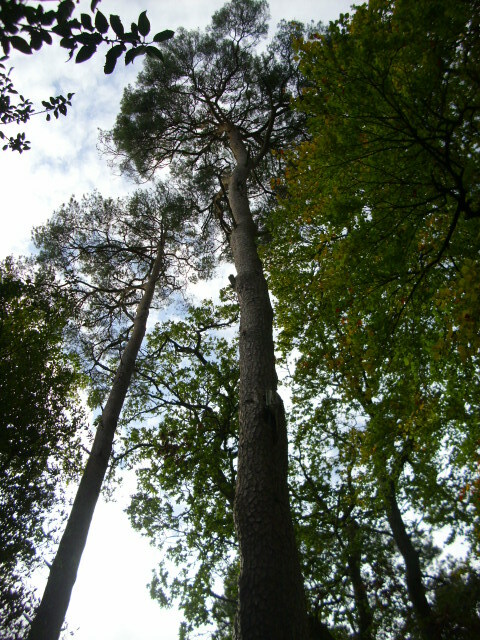 The mighty Scots Pine can grow to a height of 40 metres and live up to 300 years. The wood is known as “red deal”…it is used fencing, in house building and in telephone poles. It is high in resin which makes it longer lasting. 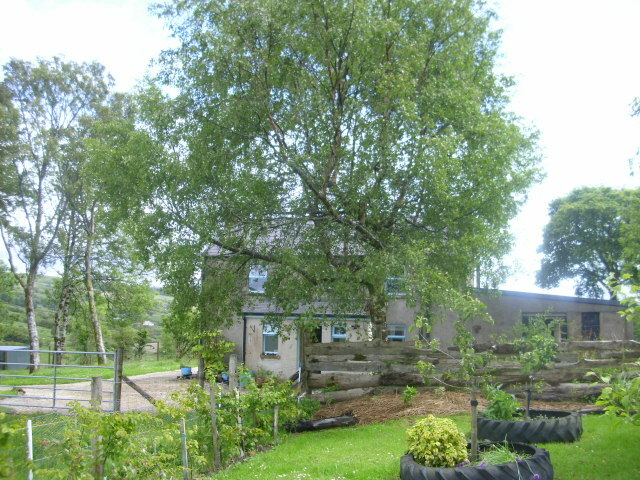 Young Oak tree at Seed Savers in Co Clare. There are 2 native Oaks…sessile and pedunculate. The difference is in the acorns. The acorns from Sessile Oaks have no stalks while the pedunculate have quite long stalks. 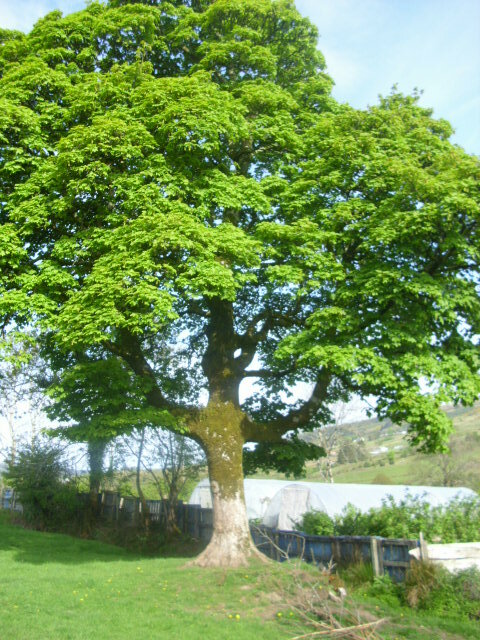 Ireland’s oldest Oak is at Tuamgraney in Co. Clare…it is 1,000 years old. The Oak pictured above is grown from an acorn from that tree. It is known as Brian Boru’s Oak. Brian Boru was the last High King of Ireland…he was killed at the battle of Clontarf in 1014 reputedly at 88 years old. Oak produces very strong timber…most of Ireland’s Oak forests were felled to be used in the making of ships for Britain’s Royal Navy. Birch, Scots Pine and Ash to the north-side of our house. Now is a good time for planting trees, especially in the mild weather we have been having. It is a good idea to plant native trees as they are accostumed to the climate…more wildlife friendly…birds and insects are fussy and will only inhabit plants they recognise. Check what grows in your area already. If something is not going to do well in your soil there’s no point planting it. 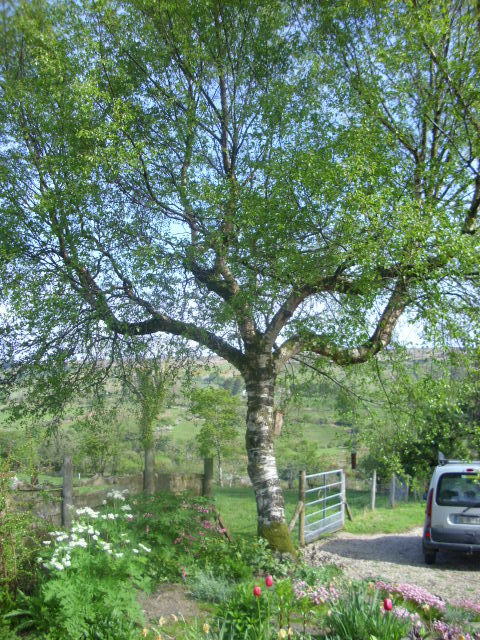 Birch, will grow in boggy, wet soil. Rowan, also called Mountain Ash. Alder, has nitrogen fixing nodules on it’s roots. 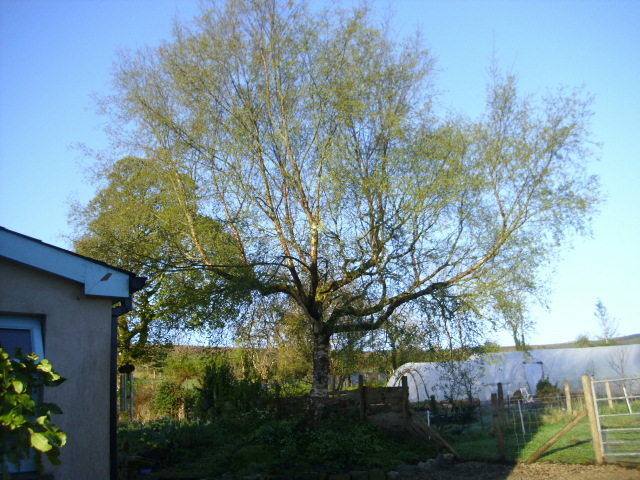 Willow, hundreds of species, grows easily from cuttings. Holly, only the female bears the red berries that symbolise Christmas for so many. Hazel, produces edible nuts that are much loved by humans and squirrels. Aspen, a fast growing member of the Poplar family. Bird Cherry, found mainly in the north-west. 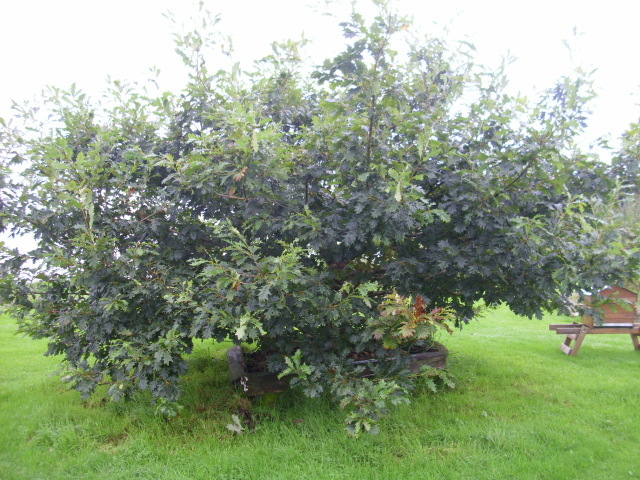 Crab Apple, produces small sour apples which make an easy to set jelly. 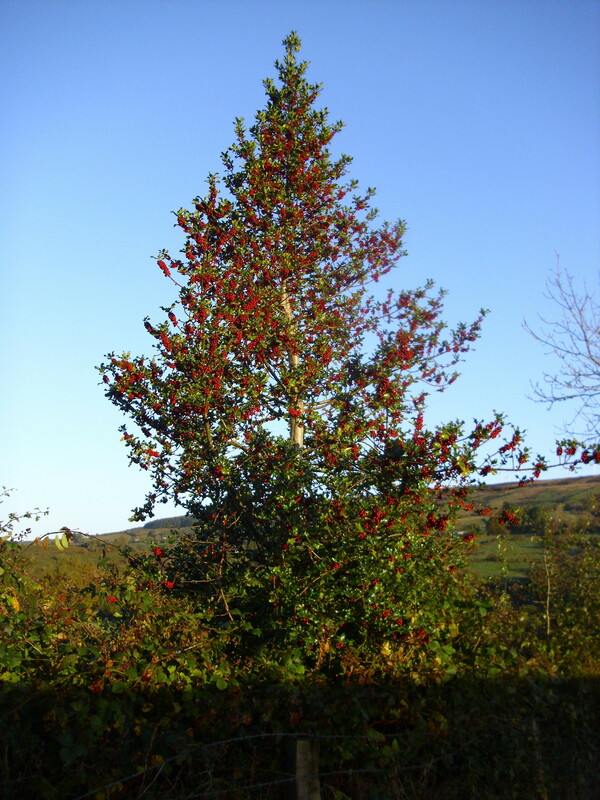 Strawberry Tree, found mainly in co . Kerry. It produces fruits which look like Strawberries hence the name. Whitebeam, has a preference for limy soils. Wych Elm, mostly wiped out by Dutch Elm Disease. Wild Cherry, grows best in alkaline soil. Yew, most often associated with graveyards produces berries which are poisonous to livestock. If you’re going to plant a tree…do plant a native tree. Wild Herbs and Birch trees. 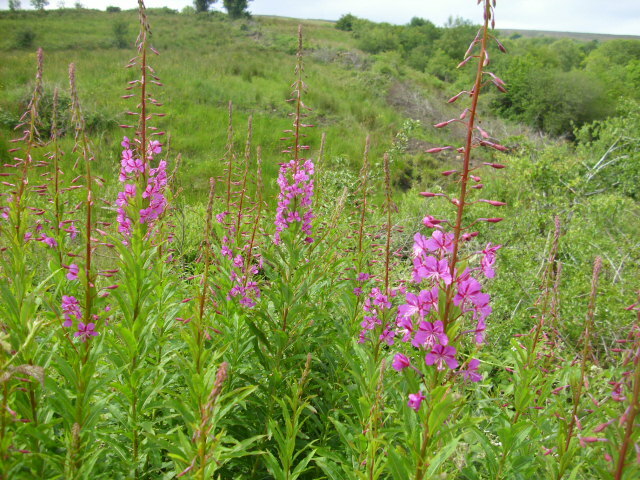 Rosebay Willowherb has come into flower overnight. I noticed it on this morning’s walk with the dogs. I suppose you could’nt really miss those pinky/magenta flowers. To me they are as pretty as any garden plant. It has to be kept under a careful eye in the garden as it spreads rapidly. Each plant has about 80,000 seeds, these have silky hairs which aid dispersal by the wind. 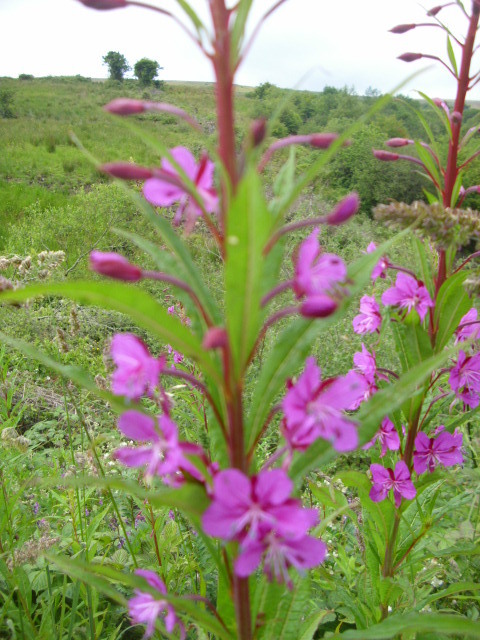 In North America it is called Fireweed and was used medicinally by the native peoples. 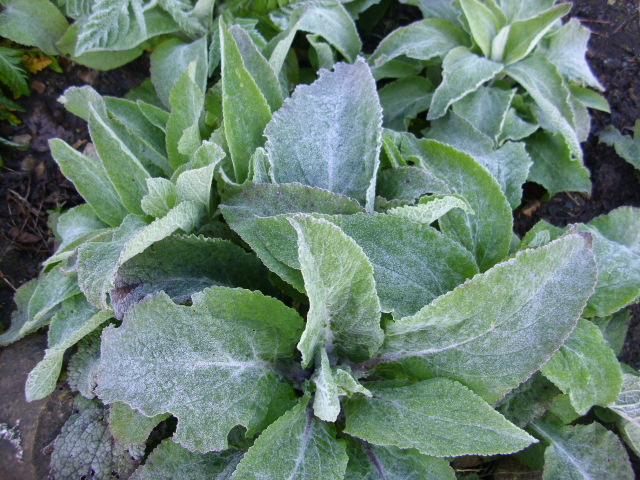 The plant became known as Bombweed because of it’s rapid colonization of bomb craters in the Second World War. It needs space and light to thrive and dies out where there are trees and shrubs. In Alaska candies, syrup and even ice cream are made from the plant. Russians use it as a tea. 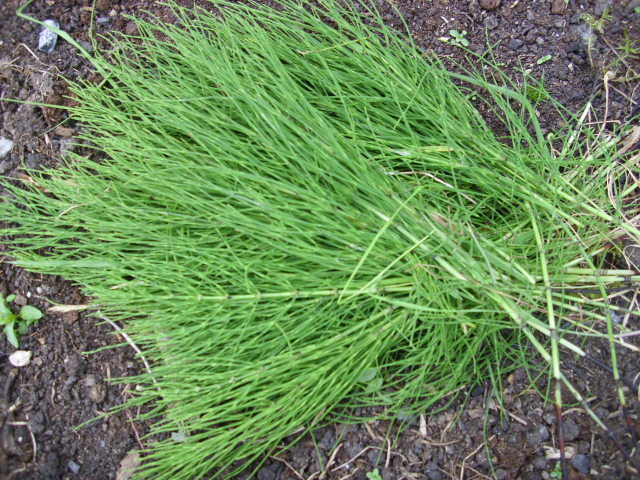 On the return from the short walk I picked a big bunch of Equisetum, Horsetail or Mare’s Tail are it common names, this will go in the liquid feed brew. Equisetum is said to be a good preventative against fungal diseases in all crops. Mixing it into the liquid feed is a good way to apply it. This is the view from the bathroom window onto the first flower bed we made here. It has filled out nicely now. 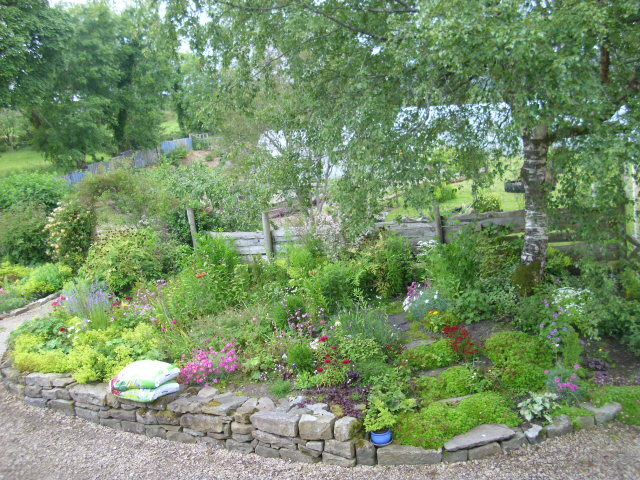 The stone was brought from an old building in the back field and most of the plants were grown from cuttings, or slips as they say in Ireland. 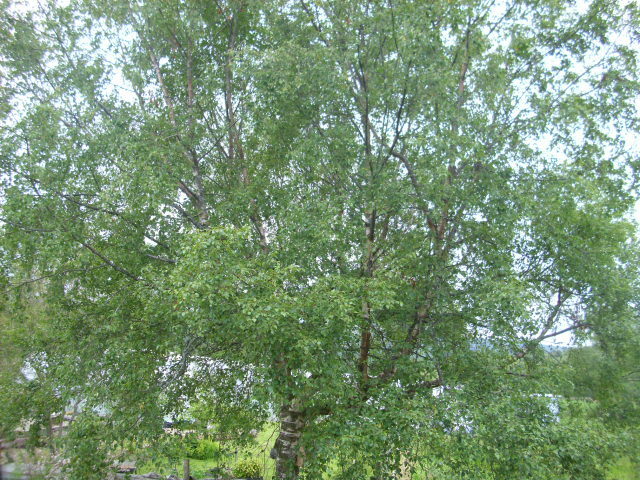 From the same window I can also look into the canopy of this Birch, one of my favourite trees. On the last day of May @ Prospect Cottage. At last the weather seems to be changing again. The strong winds have abated and rain showers are less frequent. From tomorrow, June 1st, the temperatures are set to increase and lots of sunshine is promised. Birch is one of my favourite trees. I love how it’s graceful branches and sparse foliage allow the light through creating dappled shade beneath. The one which grows outside our back door has a different habit to the other Birches on our land. They usually grow very straight but this one has a weeping habit. Beautiful. 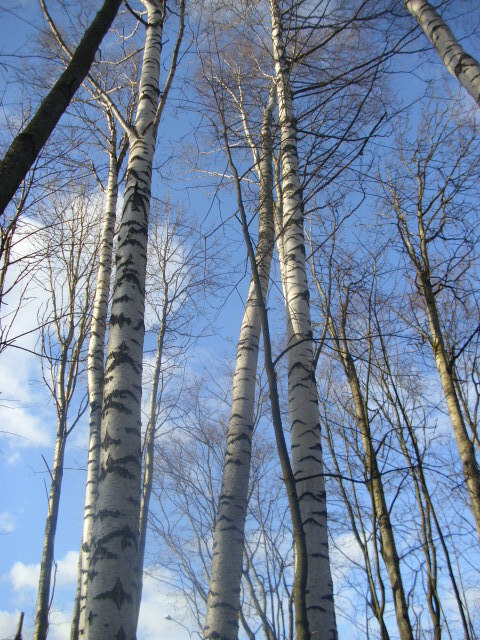 The leaves of Birch are diutetic, antiseptic and a tonic, an effective remedy for cystitis and other infections of the urinary system, cleansing the body by removing excess water. 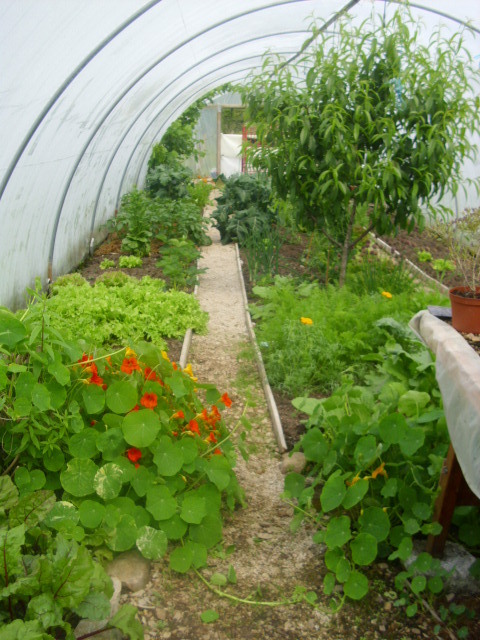 In the polytunnels there is an abundance of produce, salad crops, Spring Onions, Purple Sprouting Broccoli, Beetroot plus lots of herbs and edible flowers. I get tremendous joy from harvesting ingredients for our meals each day. The same joy is not to be had from browsing the supermarket shelves, especially as most of the produce is now from far off lands. Keeping the air miles low here in Arigna. 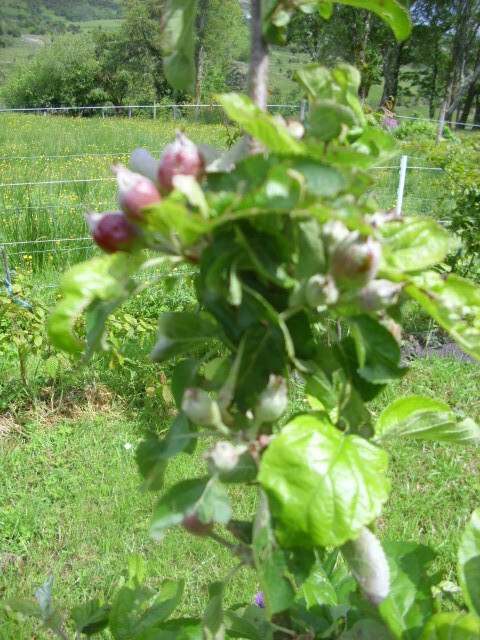 Delighted that Apples have set on this tree, Mrs. Perry, this is it’s first year to set fruit. The fruit is said to be dual-purpose, holding on the tree up to November. Don’t think these will last that long! 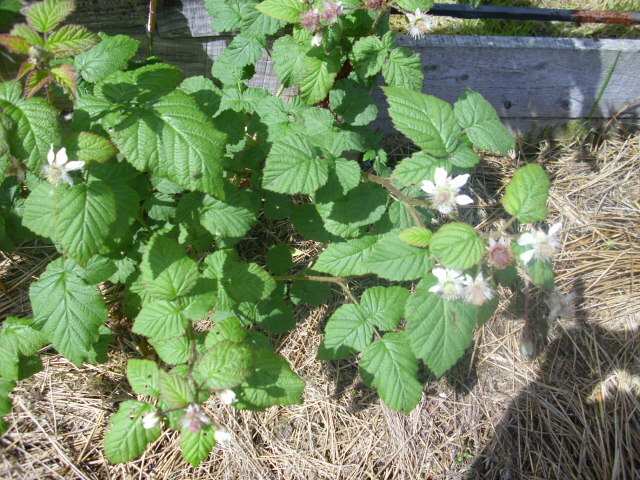 Looks like we will have Tayberries this year, this cross between Raspberry and Blackberry is delicious. It is easy to grow, we have it trailing along the fence. The fruit ripens from mid-July . We love Trees @ Prospect Cottage. Birch Tree near our back door. I wonder how often we all think of the importance of Trees in our lives. It’s a fair bet that the table you eat your food from, the chairs you sit on, the coffins we bury our dead in, the heat from our stoves and a multitude of other things all come from trees. Of course they are also the lungs of the Planet. A mature leafy Tree produces as much oxygen as 10 people inhale in a year. A shelter belt of trees around your house can reduce heating costs by up to 30%. They provide shade in the Summer, on a hot day animal and human is drawn to the cooling shade of a nearby tree. Many medicines originally came from Trees, aspirin being one, it comes from the Willow. They stop soil erosion and help to absorb excess moisture from the land. They give nourishment to us in the form of fruit and nuts. They provide a valuable habitat for birds and insects. It is said that the native Wilow supports over 260 forms of life. The mighty Oak a similar amount. The Willow also gives us basket making material, a rooting hormone can by made be soaking Willow pieces in water for 24 hours, use the water to water your cuttings or leave them in it until roots appear. 2011 was declared the International Year of Forests by the UN. Looking through the schedule of events to mark this occasion I was amazed that Ireland has, yes, you’ve got it, big fat ZERO organised to celebrate our Trees. Then I suppose that would be a bit hypocritical of them when in this International Year of Forests they are planning to SELL OFF our State Forests. No, they are more than HYPOCRITES, they are TRAITORS! We love Daisies @ Prospect Cottage! The Fatsia is making new growth despite looking a little shabby after the hard Winter. I bought this plant about 8 years ago in Woolworth’s in Enniskilllen. Of course Woolworth’s is long gone now but the Fatsia continues. 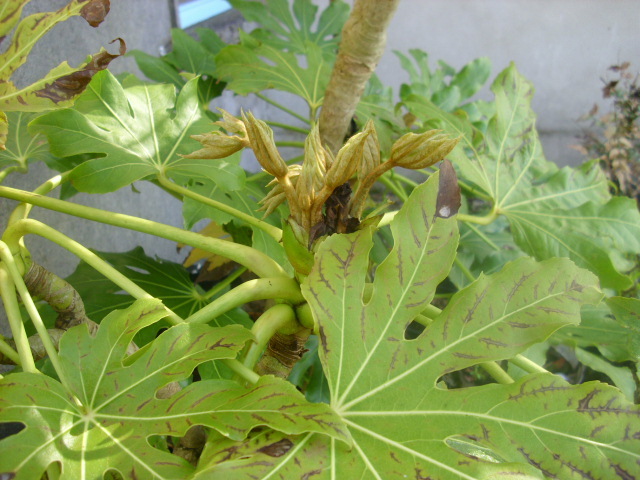 Fatsia is usually sold as a house plant, but it is in fact very hardy. This one which cost about £2 is about 5 ft tall now and resides in a disused soil filled water tank. It is situated in a shady north facing spot and seems to love it. 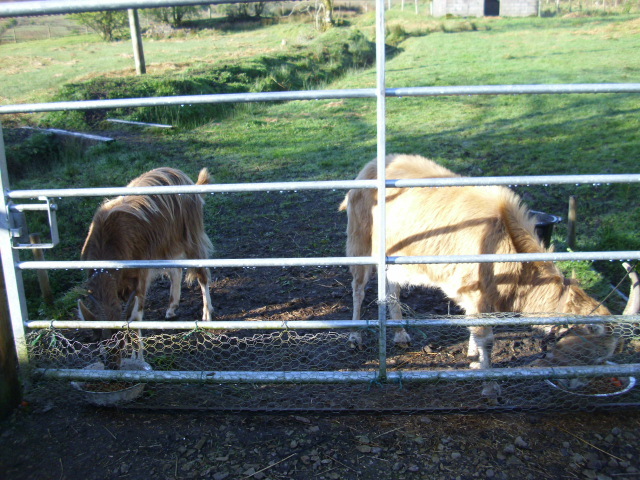 The grass has really started to grow now which the animals are delighted with. They get tired of the hay and dried food and refuse to eat it once Spring arrives. 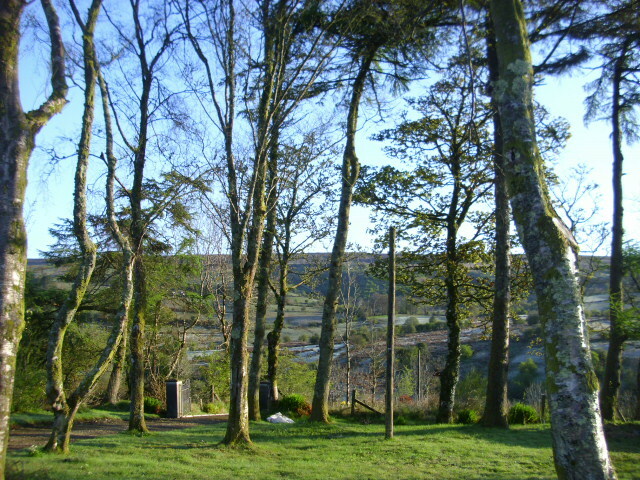 The grass in this area of Birch and Scots Pine is left to grow throughout the year. Andy mows a strip around the edge to keep it looking tidy. 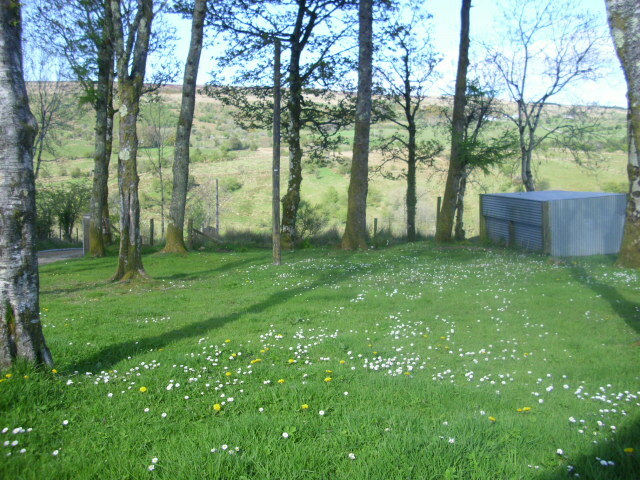 At the moment it is full of Daisies which we think look lovely. I never understood the people with the manicured lawns putting poisons on the earth to kill off the beautiful natural flowers, but I suppose it’s a totally different mindset. For me one of the many joys of the good weather is being able to hang out the washing to line dry. 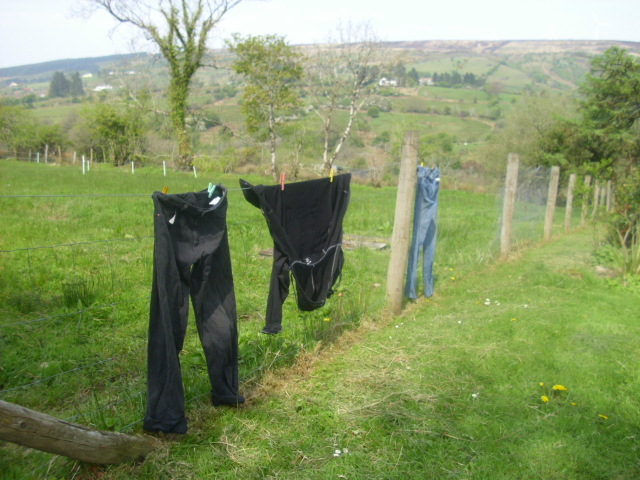 A simple pleasure, but for me clothes dried outdoors in Summer smell lovely and fresh and are less creased than washing dried indoors. We do not have a tumble drier, actually we’ve never owned one. In Winter the washing is dried on a clothes airer which hangs from the high ceiling on the upstairs landing. As the hot air from the wood-burning stove rises the washing dries quickly at no cost. 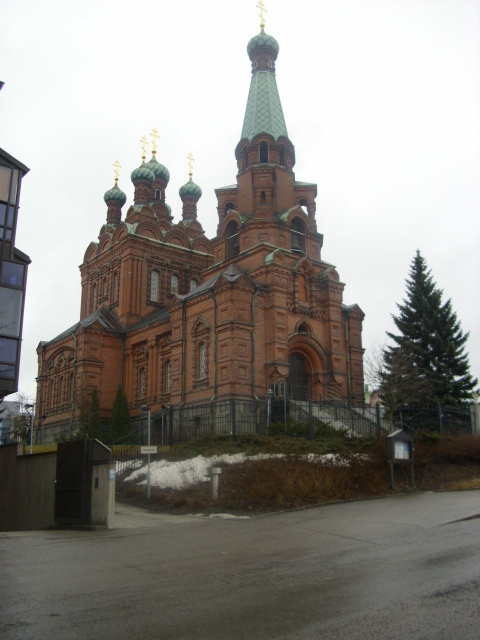 Orthodox Church in Tampere. 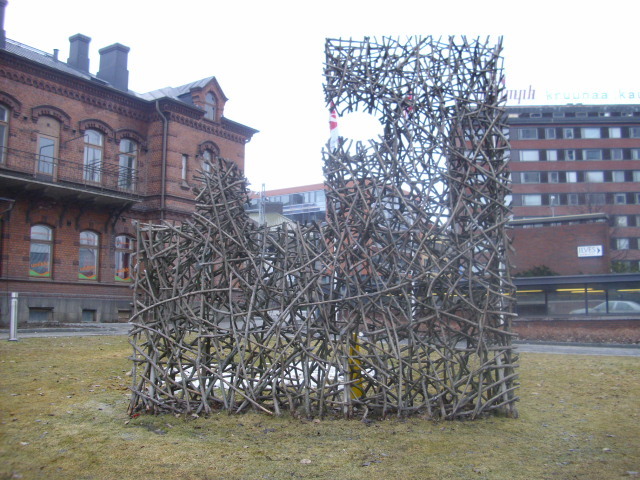 Twig Sculpture. 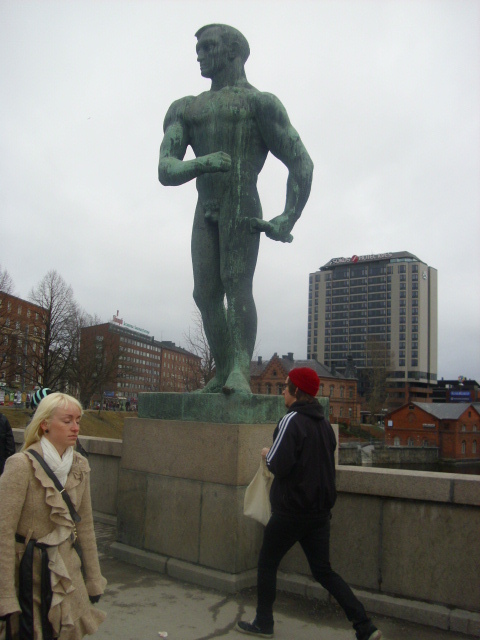 Lots of naked men sculptures! 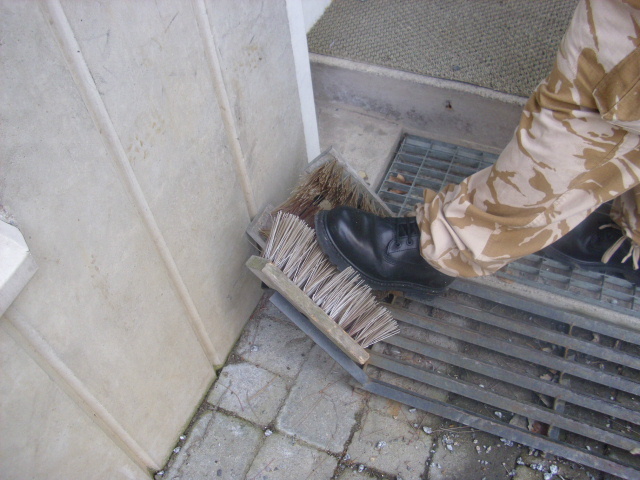 Ingenious ideas like this boot cleaner. Trees everywhere, mainly Birch, Pines and Willows. Love the white bark on the Birch. 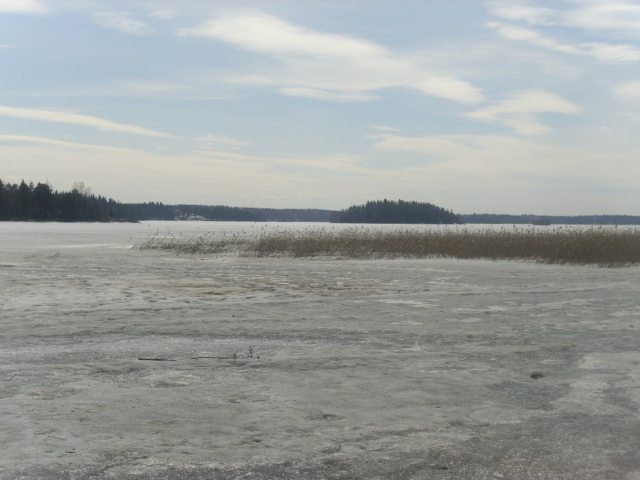 Still frozen lakes even though the weather was surprisingly warm and sunny. 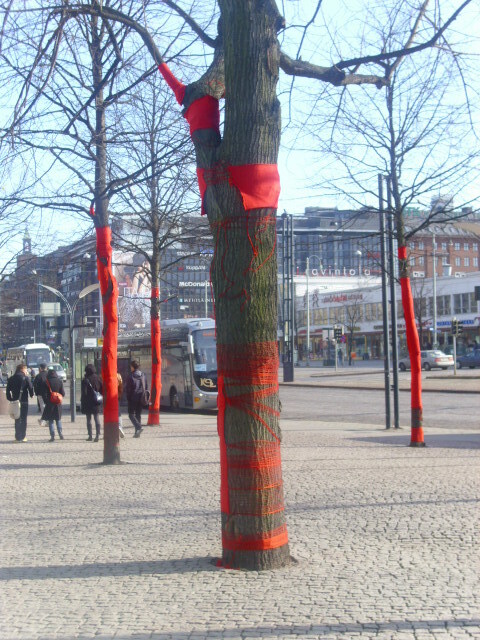 Art installation outside Museum of Modern Art in Helsinki.